American Shingle and Siding, Inc., the Atlanta-based roofing company accused of defrauding hundreds of homeowners around the country, has filed for bankruptcy, owing creditors $10 million-$50 million, according to the Better Business Bureau. 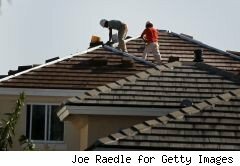 The news does not bode well for consumers, many of whom filed insurance claims for new roofs that were never installed. "It's probably the worst news that they could hear because at this point, looking at the amount of debts they're claiming and the amount of assets they're claiming, there won't be anything left for their creditors," Tom Bartholomy, the Charlotte BBB president told Consumer Ally. "So, if the bankruptcy petition prevails ... their customers that gave them thousands of dollars in insurance checks won't receive anything." Consumers who did receive new roofs should know that any warranty promised by the company is also void, Bartholomy said. Complaints against American Shingle have been mounting since last month when it closed its doors. The company, which still has its website up, operated in 10 states -- North Carolina, South Carolina, Alabama, Tennessee, Georgia, Colorado, Arkansas, Florida, Kansas and Ohio. Authorities in several states are investigating the company, including attorneys general and the Secret Service. On Monday, the Arkansas attorney general filed a lawsuit against American Shingle and its owners for failing to make roof repairs after receiving payments for them. The company is also accused of not paying its employees and suppliers. Owners of the company are identified as Richard Steffy, Carlton Dunko and Frank M. Pureber III of Florida and Hank Smith of Georgia. No one from the company could be reached for comment.